If you leave your outdoor cushions at the mercy of the elements without doing anything to protect them from the rain, wind and snow, they probably will last only a couple of summer seasons before requiring replacement. Your cushions can last for years instead of months if you pay extra attention when choosing them -- and you get into the habit of taking some easy steps to maintain them. A large part of the maintenance is keeping them as dry as possible. 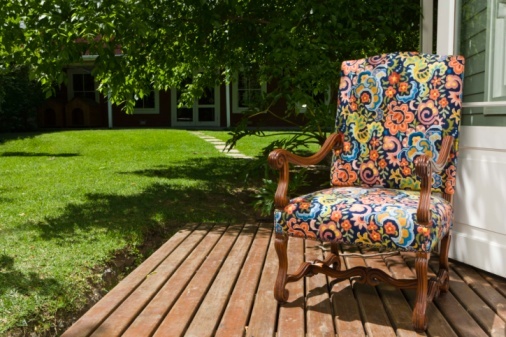 Caring for your outdoor cushions will lengthen their life. Choose a durable, weatherproof, material when buying your outdoor furniture cushions. The traditional cotton cover with a urethane foam filler is not the best option for cushions exposed to the elements. More modern fabrics are tougher; some are resistant to mold and mildew. A waterproof filler will also help. Materials like vinyl, polyacrylics and fabrics specially designed for outdoor use can have the appearance of more traditional fabrics, but stand up better to unfavorable weather conditions. Weatherproof your cushions with a waterproof silicone spray to help protect them from mold and mildew. Choose a spray specifically made for your cushion's material. Apply waterproofing spray if your cushions did not come with a weatherproof coating and after you have washed them. Spray the cushions thoroughly outdoors to avoid inhaling the fumes. Let them dry completely in the sun. Buy iron-on vinyl to cover your cushions if you want a more permanent solution. Remove the filler from the cushions first. Create a sealed envelope around the cushion cover with the iron-on vinyl. Place the cushions with the zipper or buttons facing downward when using them on your furniture. This minimizes the chance of any water entering the cushion through that vulnerable area. Cover the cushions with clear plastic to keep them completely free of moisture. If the cushions came packaged inside a thick, clear plastic cover, you can leave it on, or you can buy plastic protective covers. However, you may not find this solution aesthetically pleasing. Put your cushions in the garage on rainy days if possible. If you do not have indoor space, stack the furniture if it is a stackable variety. Alternate the chair that you leave on top of the so that one cushion does not become more weather-beaten than the others. Clean your cushions regularly with a cleaner that helps keep the fabric free of mold and mildew. Steve Sparkes started writing professionally in 1982. He was a journalist and photographer for "The New York Waste" magazine for a decade. Sparkes has a diploma of art and design and a Bachelor of Arts in history of art from the South-East Essex School of Art. He also has a Master of Arts in photography from the London School of Printing and Graphic Arts. Can You Waterproof Indoor Cushions for Outdoor Use?